Recently, we reviewed the Aeron chair versus Embody and made comparisons between the two. Now, this time, the Aeron chair will be going up against the Mirra 2. 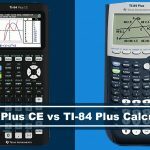 We decided to do this comparison because of its similarities. These two chairs are very comparable in their adjustability, ergonomics, design, and materials. We won’t go into great details in regards to the Herman Miller Aeron Chair because we’ve already gone through it, but instead we’ll focus more on the more notable differences. The Aeron has incorporated many years of trial and error, and have gathered tons of user experience on how to make a task chair more ergonomic and comfortable. This char was debuted in 1994, and now it has been remastered to help support people’s postures as they go about working at their desk. Mirra 2 moves with you as you sit down, it adapts to your body. This chair is unique and has dynamic surfaces that can respond to your slightest movements. This office chair balances immediate comfort and personalized ergonomics in one sophisticated design. Adjustable Seat Depth N/A 16.25" - 18"
Seat Height Size A: 15" - 19"
Size B: 16" - 20"
Size C: 16" - 20" 14.75" - 22.25"
Herman Miller has been around for a long time, knowing this, they’ve always strived to provide the best customer service experience on the market. If there are any issues with your purchase, Herman Miller is there to help. With their chairs, you’ll have 12 year limited warranty if anything goes wrong with it. Also, if you don’t like your purchase within 30-days, you can return it without any questions asked, and no hassle at all. Unique breathable Pellicle suspension dissipates the body heat that builds up while you work, keeping you cool and comfortable, while providing unparalleled support. Since the Aeron is very similar to the Mirra 2 chair, some of the notable features that distinguish between these two are the customization. 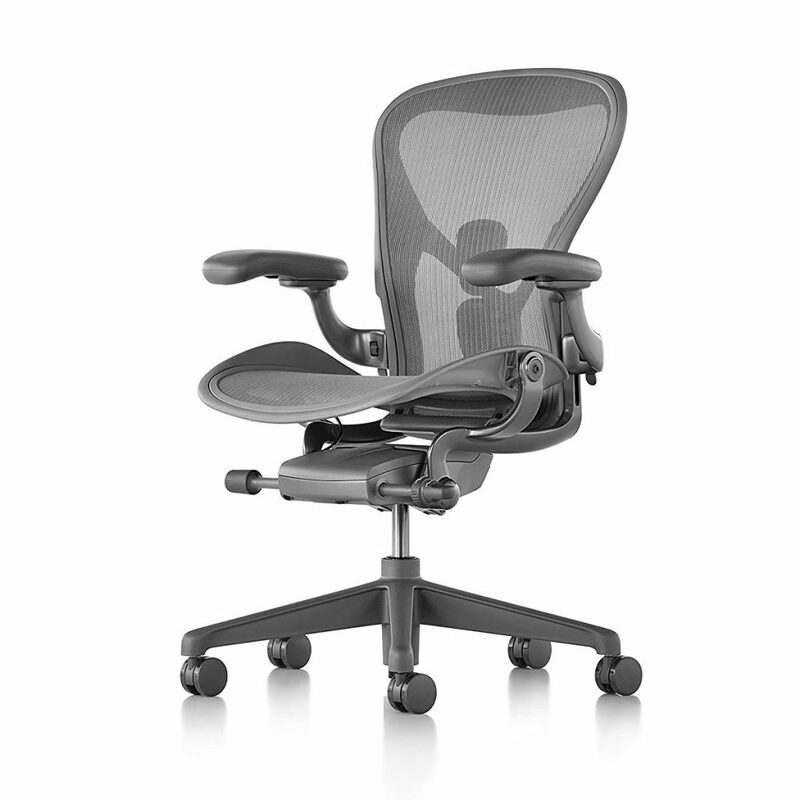 Although all Herman Miller chairs allow you to customize to allow you to have the best chair that forms to your body, the Aeron has a little bit more options to choose from. There are different Aeron chair sizes to account as well. This could be confusing, fortunately, you can take a look at this Aeron chair size guide to help you decipher which one is right for you. The Armrest – The Mirra has more armrest positions where you’ll be able to adjust to your comfort zone. Seat Depth – Unlike the Aeron, the Mirra can adjust the seat depth. Seat Height – Because of the different seat sizes, the seat height varies for the Aeron. Again, we won’t go too many details because we’ve covered it in our Aeron chair product review and in this Aeron vs Embody chair comparison. Lean and very light task chair that acts like your shadow. It conforms to your body and every movement, providing you the most comfort while working long hours. 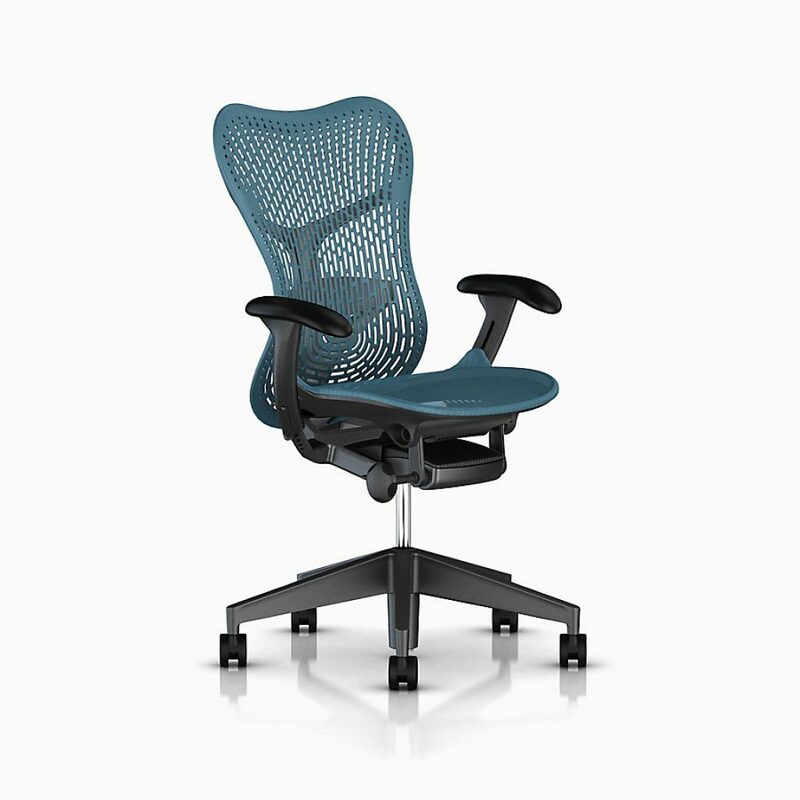 Herman Miller Mirra 2 is designed by Studio 7.5 which was inspired by the balance of comfort and personalized ergonomics. The Mirra 2 is lean and light that gives support for the people who work in a constant state of motion. This chair allows you to be agile with your work style, and is ideal when you’re in a collaborative work environment. Unlike the Aeron, the Mirra 2 has two different back support options, the Burtterfly Suspension and TriFlex Polymer. The former back option costs a little bit more but it essentially conforms to the shape of your back like a suspension membrane, and supports you as you move while allowing airflow to keep you cool. The Triflex Polymer’s perforated design allows the chair to flex with you and allows maximum breathability and easy cleaning. 4D adjustable armrest, giving you full ergonomic control. Forward tilt seat angle, allows you to tilt the chair forward. 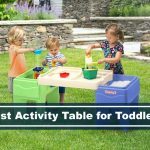 Most comfortable for long periods of sitting. Mirra’s back is flexible and molds to your back. Can adjust the tension of your lumbar support. Comfortable lumbar support with any adjusted angle. Mesh material chair for air flow. The armrest can wiggle a little. The forward tilt of the seat can be uncomfortable. The seat can give away for heavier individuals. Both are great chairs for the office. If you’re looking for something softer, we suggest the Mirra 2, while the Aeron has a more firm feel to it. Both chairs are great in air flow and you’ll never feel a rise in temperature when sitting for long hours. If you’re looking for a comfortable and ergonomic chair for your gaming desk setup, we’ve suggested looking into the Herman Miller Embody chair. Even though these chairs can be a little bit pricier than most, we think it can be justified by the attractive features it has to offer. 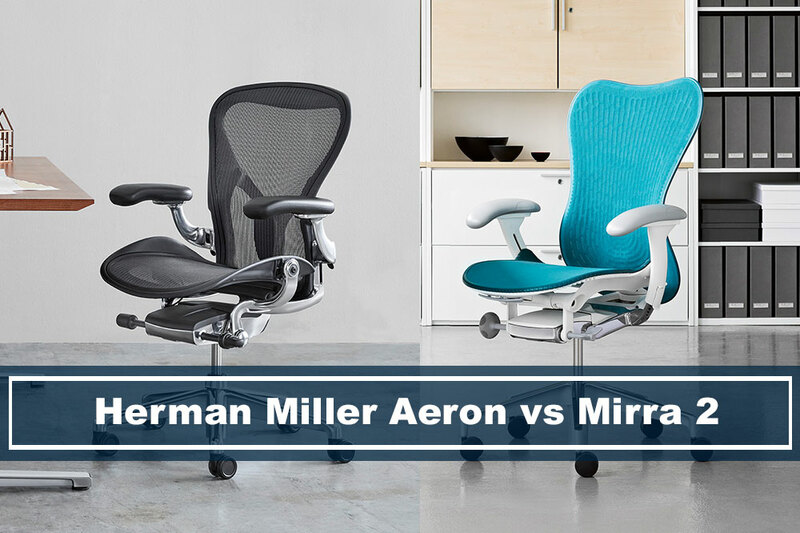 Whether you choose the Aeron or Mirra, we think you’ll be a happy customer and become part of the Herman Miller family for a long time. 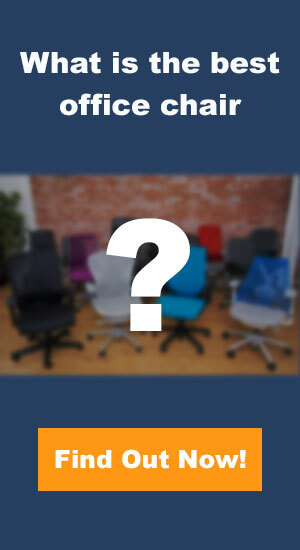 Want to find out what other Herman Miller chairs are the best? Take a look at our best Herman Miller chair guide.